Hello! Welcome! I am so excited about today! 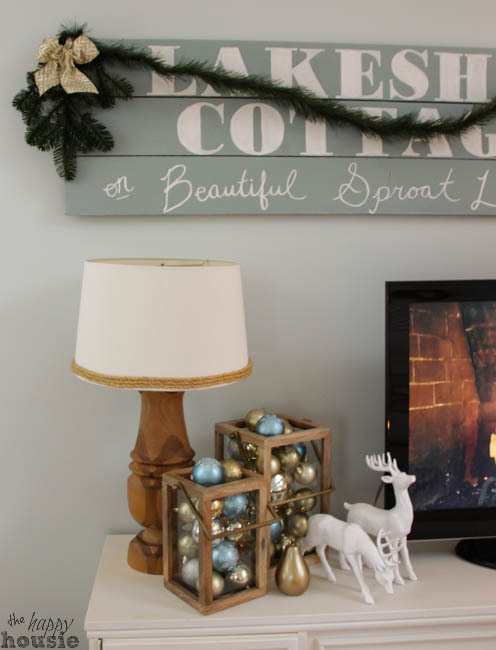 It is Christmas Home Tour day! Who doesn’t love a good house walk-through?! I know, I know, it would be much more fun if I would actually open up my drawers and closets and show you how we “really” live… or even if I lifted up the couch cushions and you could check for some hidden crumbs under them. But let’s leave all that for another day, shall we? I mean, it is Christmas after all. 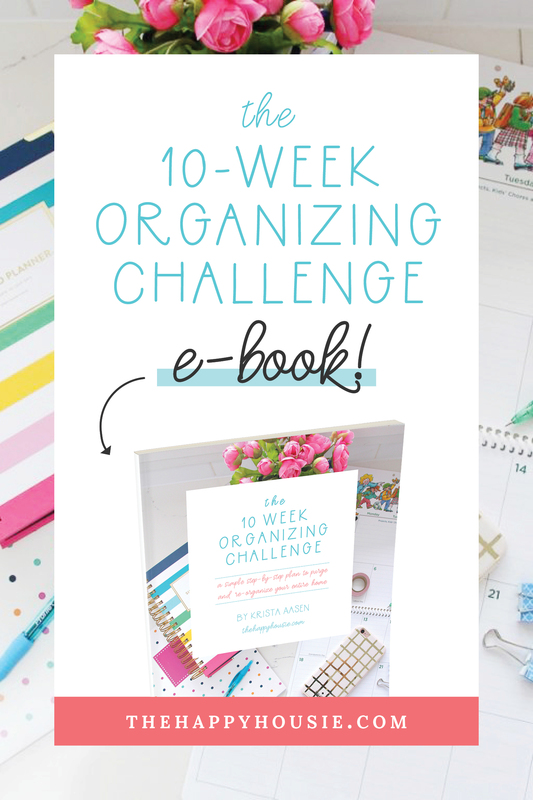 Let’s focus on the pretty stuff… and come January we can get down to some organizing solutions. 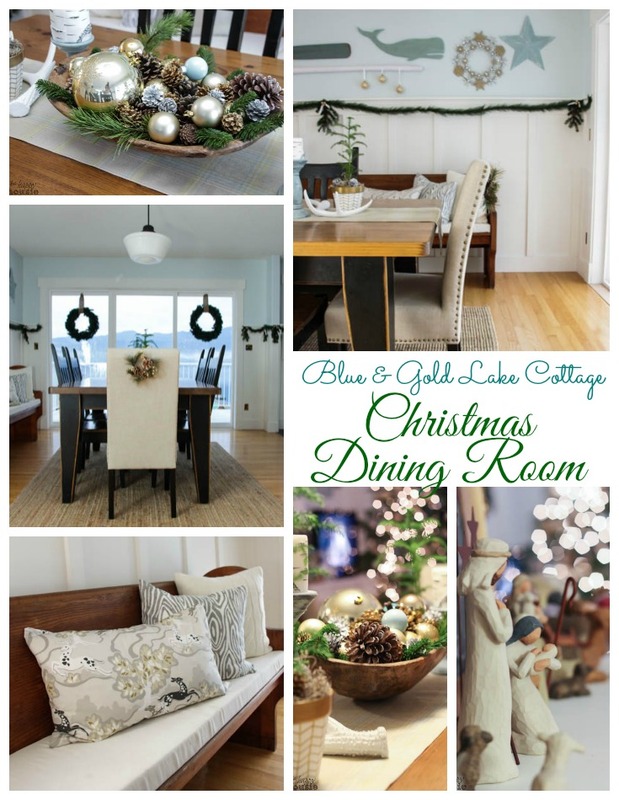 So today I am sharing our Christmas living room; and each day this week I will be back with other rooms: our dining room, front porch and entry hall, our master bedroom, and our boys’ bedroom and the main bathroom. Without further ado…let’s get on to the living room tour! I can’t wait to see what you think; this year’s look is quite a change for us! 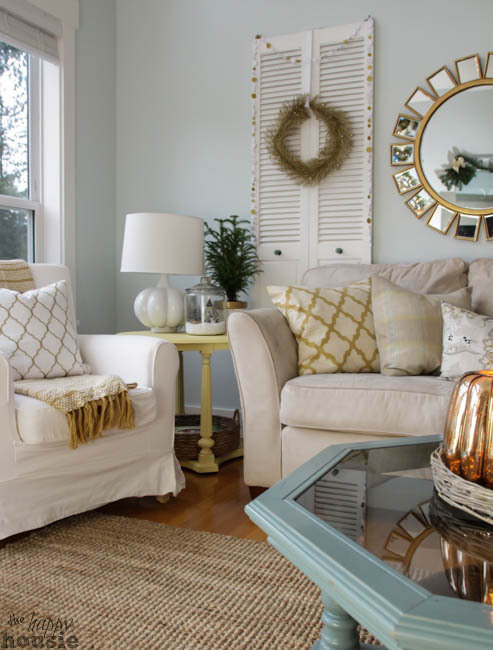 The entire living room was given a new look recently with a fresh coat of paint; the colour is Whispering Spring by Benjamin Moore. Since the walls were fresh, why not add some new wholes to them, right? So I decided to go ahead and change up the gallery wall at the same time. You may recognize a new key piece (i.e. 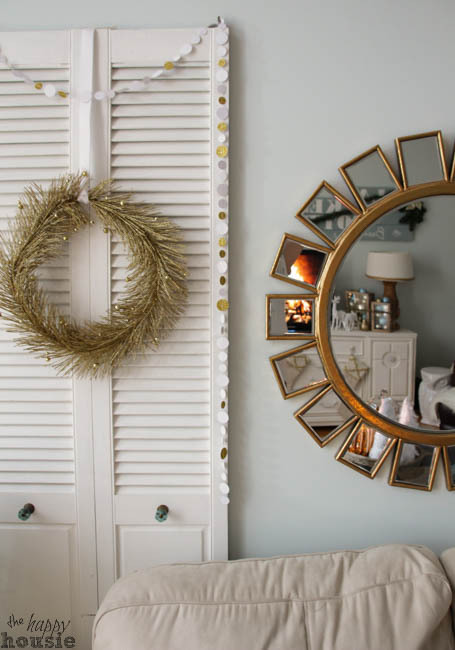 the sunburst mirror – I picked it up on Clearance on Home Sense); but the rest of the gallery wall was either part of the old one or was brought over from the dining area. 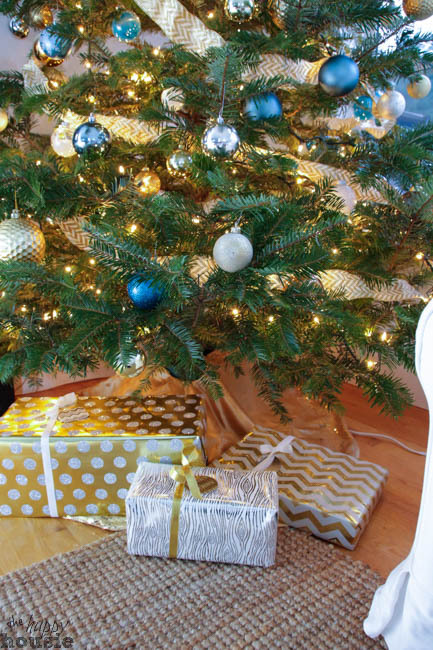 I found my inspiration for a gold and blue Christmas this year through some gorgeous fabrics that I picked up at Tonic Living (this, this, and this). 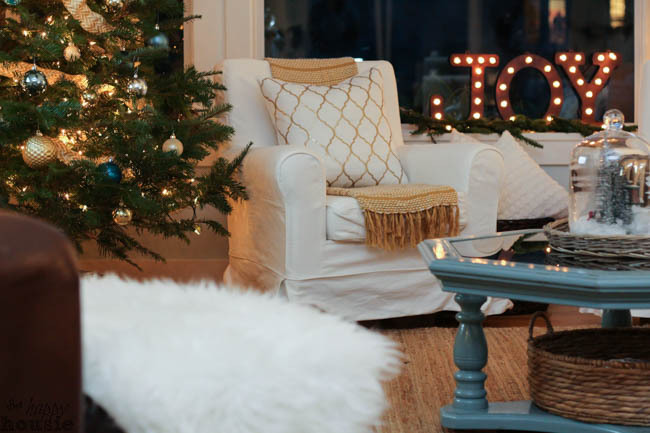 They really spurred on the whole new subtle, cozy, and calming look for this Christmas season. 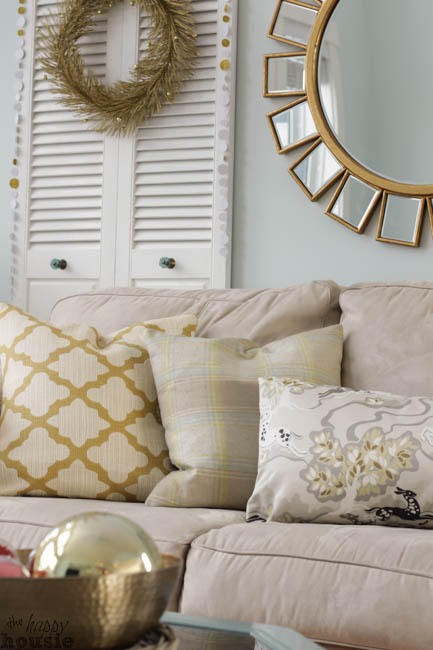 Fabric is almost always my starting point for a room; I love how easily you can give your space a new look by swapping out the pillows. 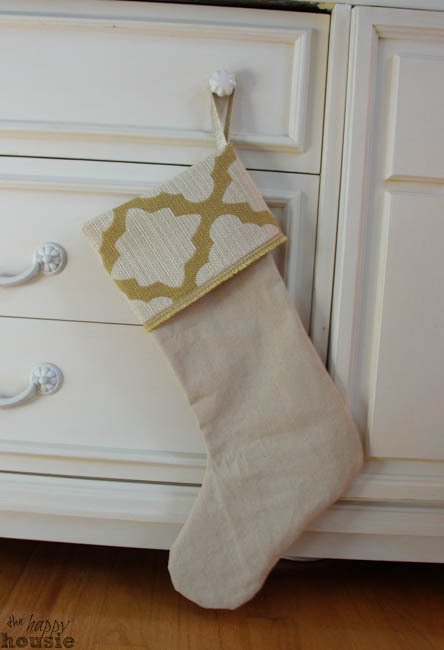 And in case you missed it, I shared the table runner that I created out of the leftovers from my Christmas/Winter pillows the other day… and keep your eye out for a stocking I whipped up using another extra little leftover of fabric (gotta use those scraps!). 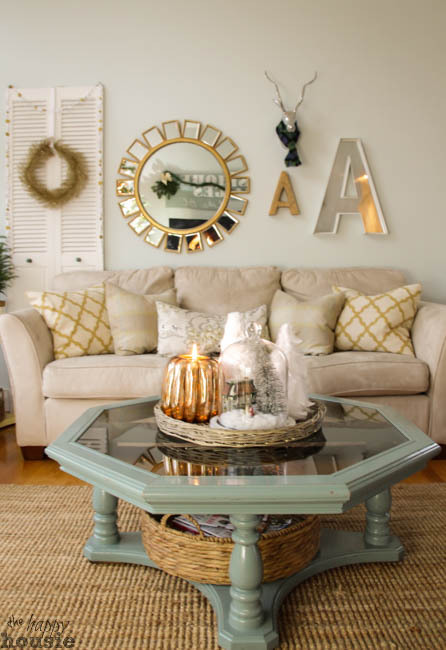 I was hoping to create a pretty and relaxed feel in our living room – and wanted a look that would last beyond Christmas and through the whole winter. And really, the Christmas season is all about rejoicing and sharing JOY, isn’t it?? And what’s not joyful about relaxing? (Well, at least that is what I hear; I haven’t really mastered the whole relaxation bit yet). Come join these other incredible women as they show off their homes. 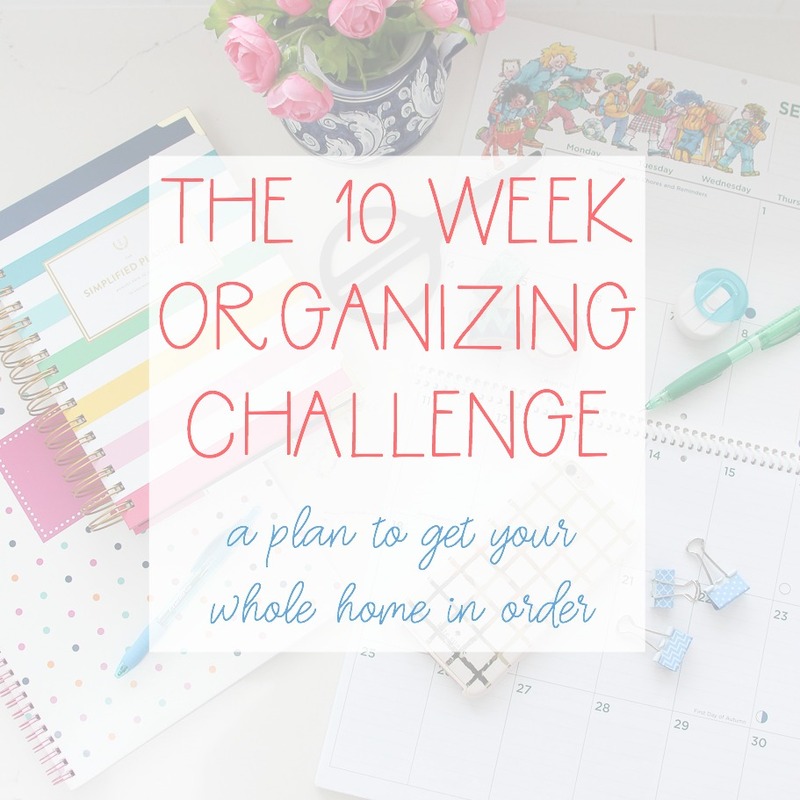 I can guarantee that you will gain inspiration and ideas for your own home each day during this tour! I know that I can’t wait to take these tours!! Hope you enjoy them too:) Have a great day! 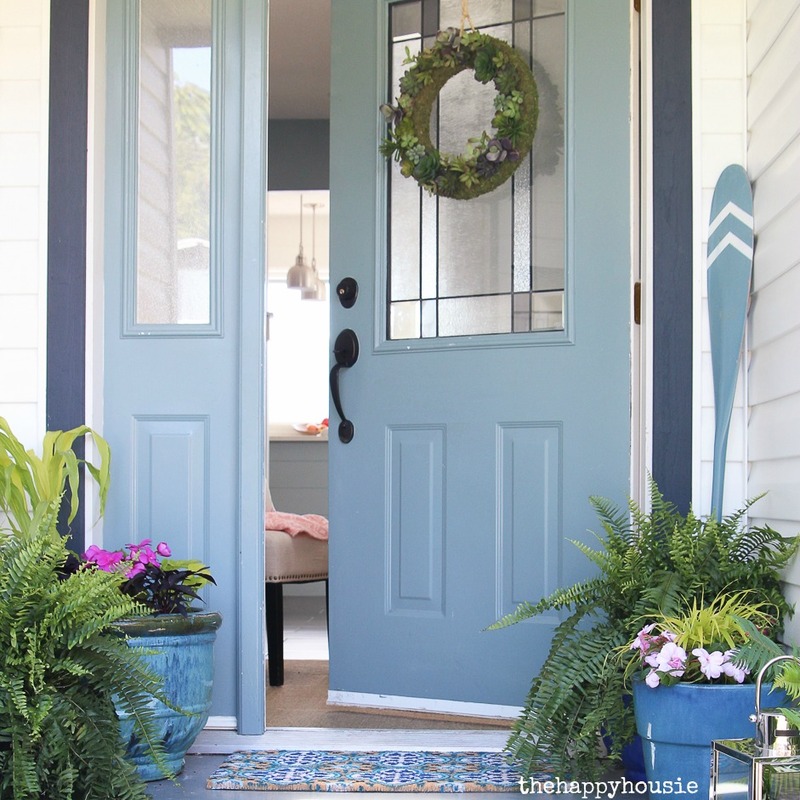 Krista, I came across your blog through Pinterest and can I say that your home is just stunning. I absolutely loved everything I saw. 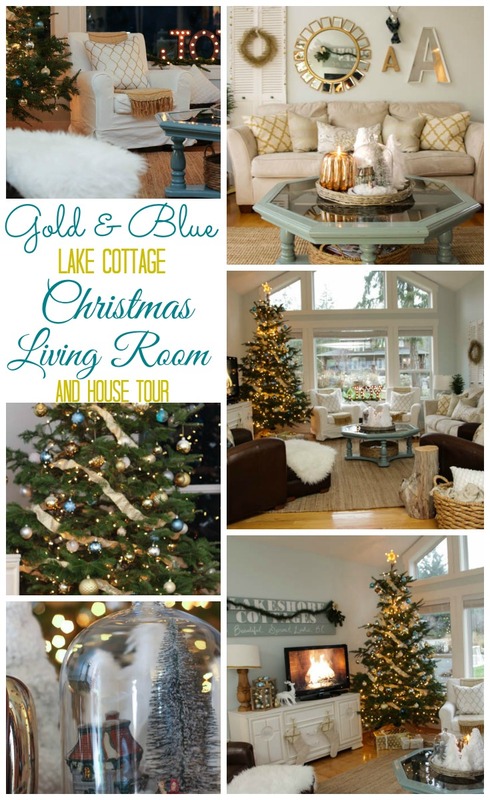 I’m so glad I came across your group of Canadian Christmas House Tours! I have been so inspired. I even went to the link you included for your material! 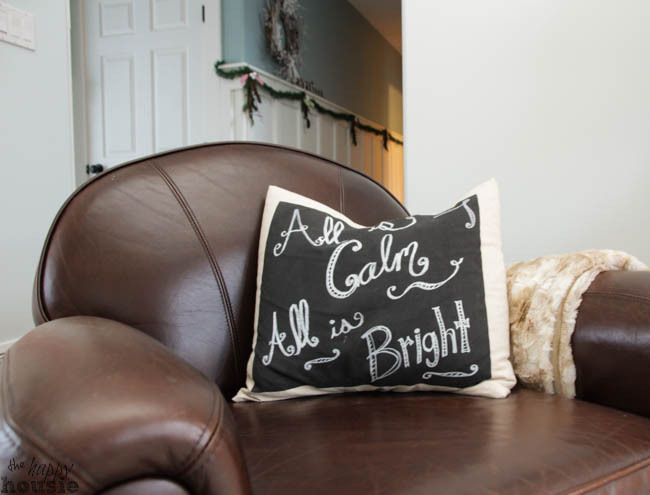 I am totally obsessed with the throw pillows you have on your slipcovered chairs. Can you please share where you purchased these? You now have a huge fan in Northeast Pennsylvania!! Hello! Thanks so much for your awesome comments- you made my day:) I think you are talking about the gold sequined pattern pillows on the chairs? Unfortunately I didn’t make those so I can’t provide you with a fabric source. I bought them at Home Sense (which is basically the Canadian version of Home Goods). 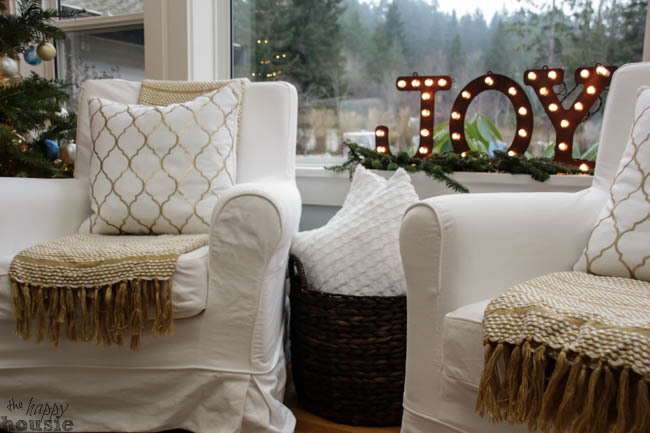 I love them too- even though we have taken down all our Christmas décor, the pillows stayed. I think they will be great all winter long! Thanks so much for coming by!! This is so pretty! 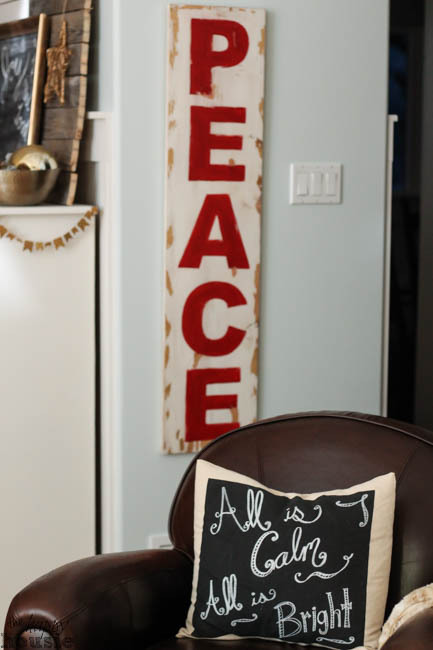 I love the way the color scheme and decor integrate perfectly with the items that are always in the room. 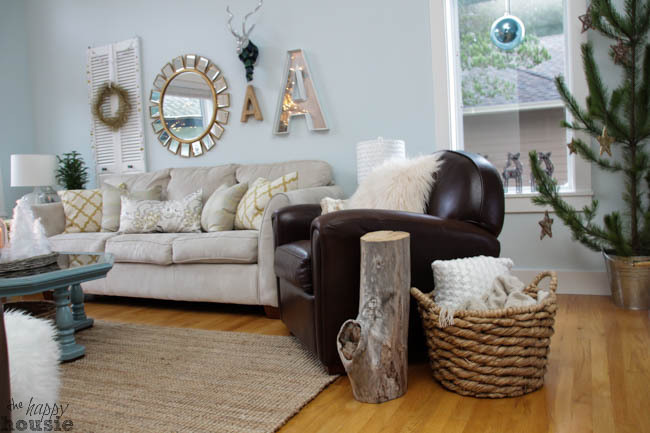 Your home tour looks fabulous, Krista! 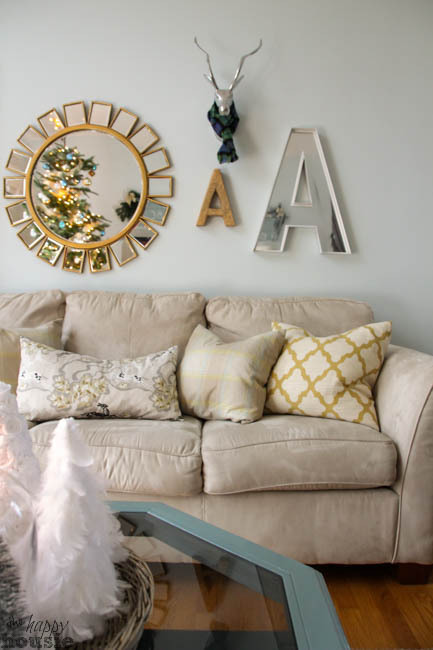 Loving that new wall color and the As above your couch! I also love your holiday color palate! Beautiful, Krista! So warm and cozy! 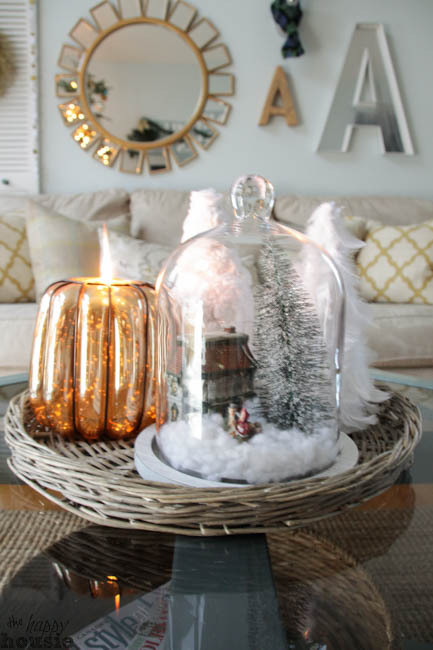 You always blow my mind away, with every single seasonal decor you do! Wonderland! !♥Pinned and shared! Lol- thanks Aniko! You are too sweet:) Thanks for the pin and shares, friend! 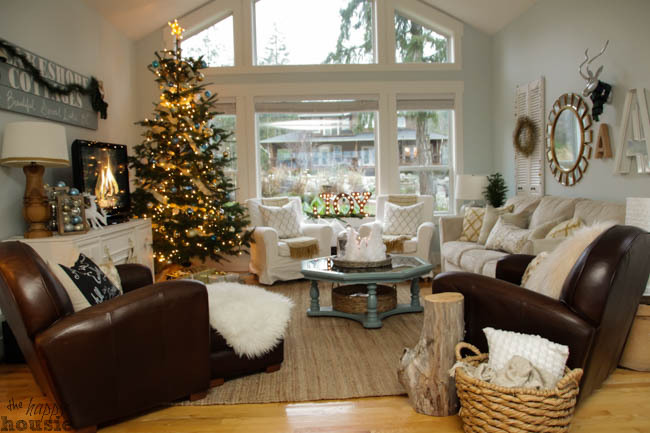 Beautiful Living room, it looks so cozy and inviting! It is all so pretty, Krista! I will be checking back daily as you share the rest of your home! 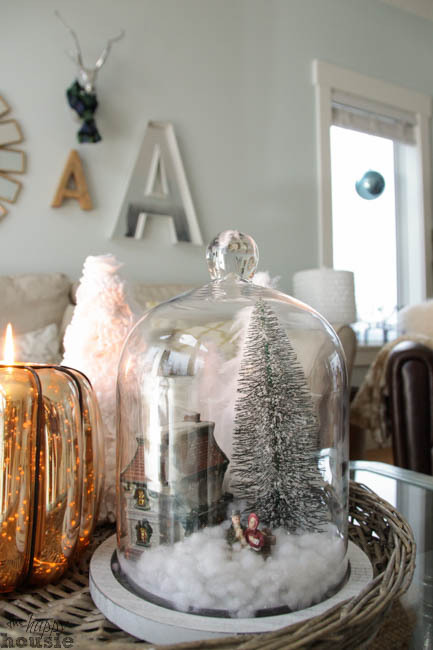 I love that jar filled with “snow” and accessories! So pretty! 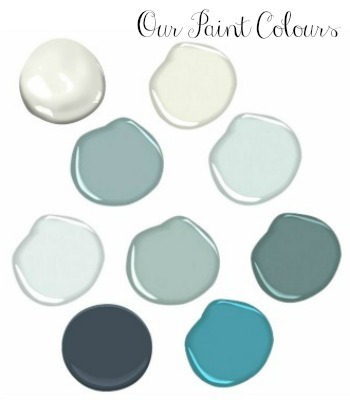 Love your new paint colours too! 🙂 Hope your kitchen is coming along… I know you’ll want it done as much as possible for the holidays! So, so beautiful, Krista! I love the relaxing blue and am EXTREMELY jealous of that giant window. What a gorgeous space! 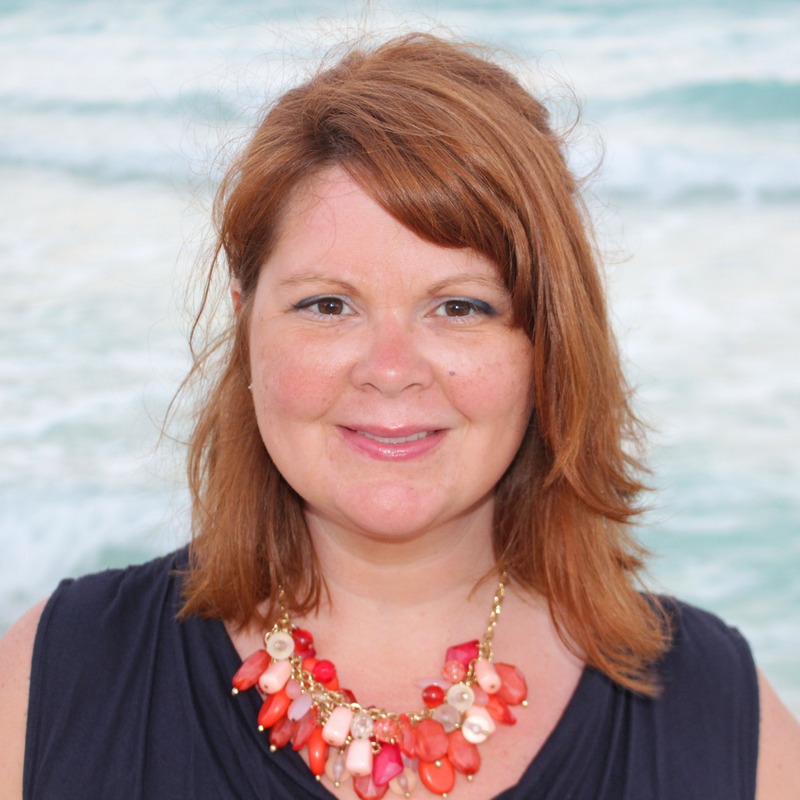 Thanks for sharing your home! Thank you Liz! I love that window too- and all the light it gets. We just added huge new windows across the back half of the house too- aren’t windows the best thing? Light makes every space so pretty (wish we had a little more sunlight this time of year!). So thrilled you came by – can’t wait to take your tour!! Oh Krista!!! It’s all SO stunning! I’ve got such envy of your beautiful home and style, I wish I could just move right in to your lovely home!!! SO pretty my friend! Sometime when I’m out your way we’ll get a chance!!! Thank you so much Jen!! I am so thrilled to be part of the tour- thanks for all your hard work organizing it! Hahaha – yes, thanks Jenna. You do what you have to, I guess. 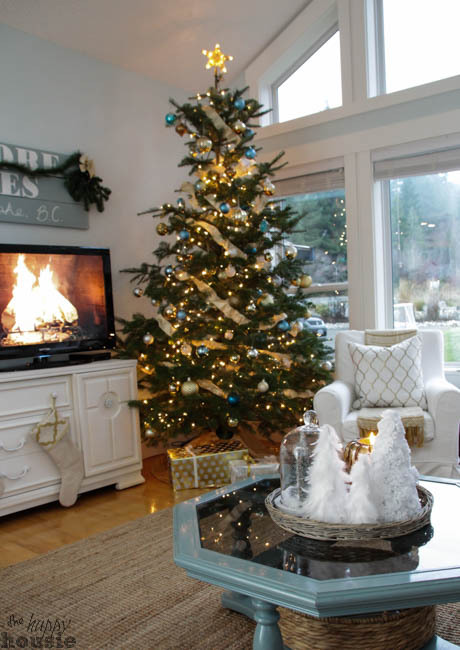 Truly, we would love to install a fireplace with a gas insert in the living room- but that may (fingers crossed) happen next winter. Until then, I guess a TV it is, lol. My boys get a kick out of the man’s hand that comes in to change the logs over every now and then. Thanks for coming by! Thank you Nina! I hope we get our kitchen finished (or at least functioning) so that we can enjoy some family gatherings here this year! Happy Christmas Krista! 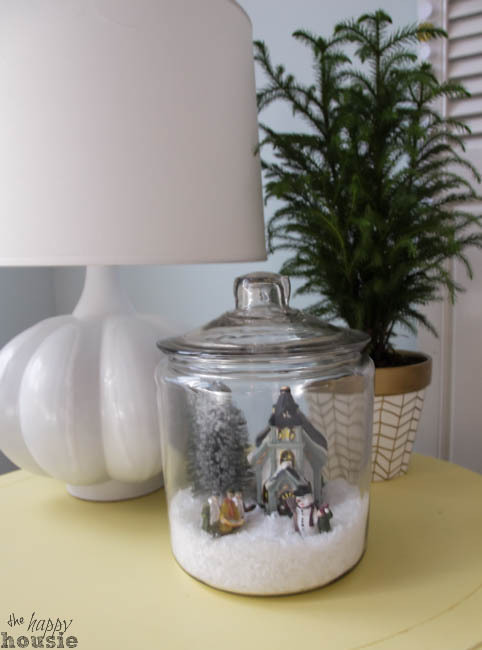 Your home is so beautifully decorated for the season, thanks for sharing it with us!!! Merry holidays to you. Thank you so much Shannon- I am so thrilled that you came by!! Aren’t those JOY letters so fun and cute? At first I thought I would use them outdoors but then the logistics of the extension cords was getting to be too much for me. 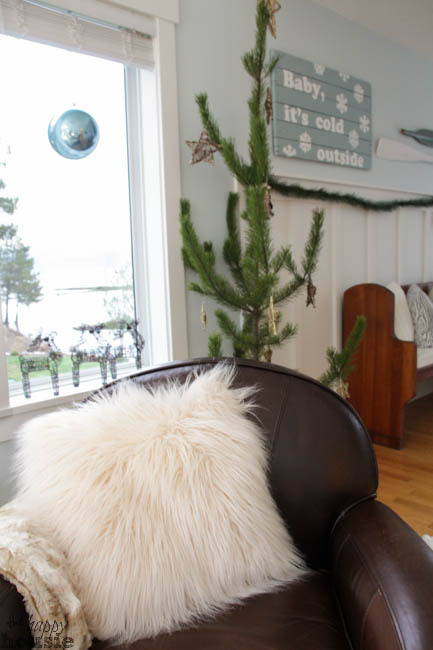 Not only is the greenery pretty, but it artfully hides some unsightly cords:) (shhh, don’t tell anyone that it is really functional:) I can’t wait to tour your Christmas home this year! Krista, you have been hard at work, my friend! Beautiful room, and I love all the gold and blue you’ve added. Thank you for sharing! Thanks so much Rachel! 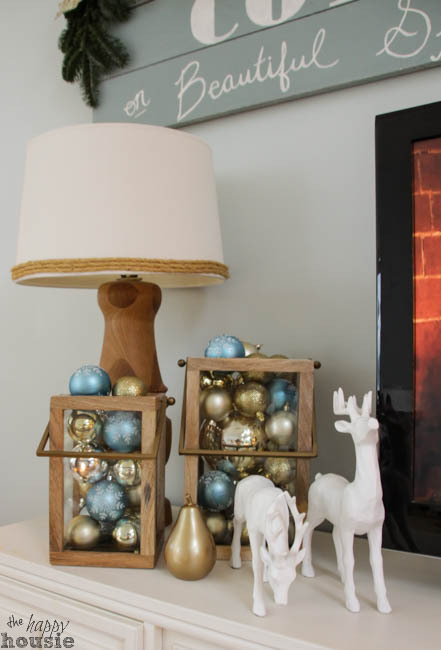 A bit of a change for me… all your beautiful neutral décor must be inspiring me:) Can’t wait to see your Christmas home! So pretty, Krista! 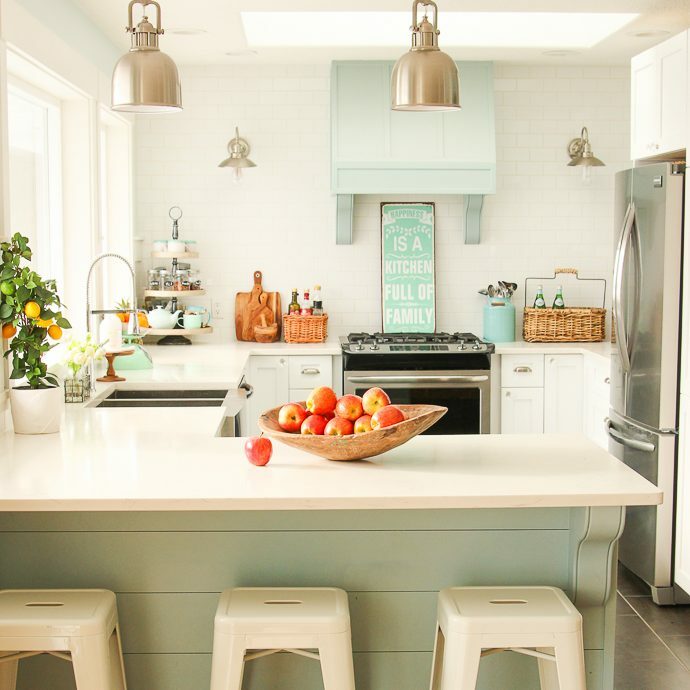 It definitely has a more neutral feel than some of your past home tours, but it is very, very pretty! Love it! Hi Alexis! It DEFINITELY feels more neutral, doesn’t it?! But I kind of love how calm and wintery it feels… I am sure I will be ready for some bright colours again come spring! Gorgeous, the blue and gold is so pretty. I love the gallery over the sofa too. Beautifully done. Thank you so much Marty – I am so thrilled that you came by!! 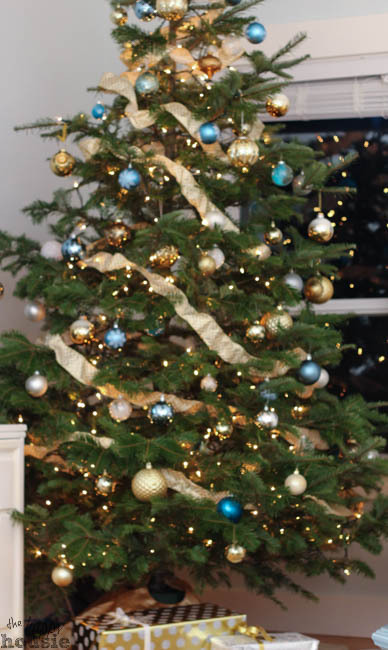 Beautiful – love the colours – so calming and festive at the same time! Thank you! I agree, everything is festive right now, but take a way a few things and the colour scheme will work with me throughout the winter. So, less work come January:) Thanks!! beautiful, krista! i love the blues and golds! Thank you Cassie! It is a bit of a departure but I am loving the more subtle colour scheme:) So thrilled you came by! I love the pops of gold with the blue very pretty Krista. Great job with your holiday decor Krista!! I wish I could come over for a visit and see it for myself in person!! 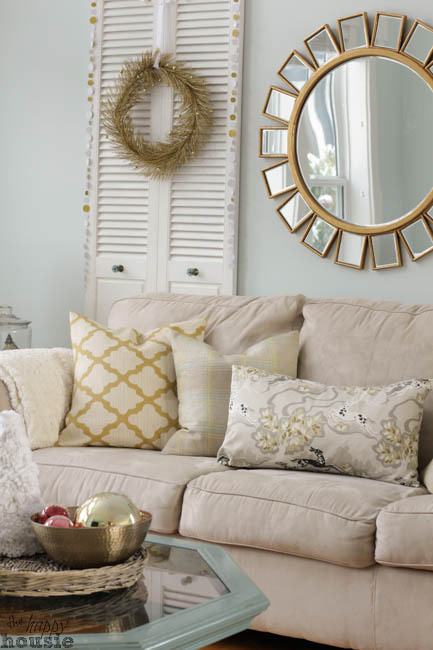 Love your wall color and your pillows are so beautiful! Pinning! Ooh I love it! I’m totally into blues and golds, so this is right up my street. They make such a pretty mix, don’t they?! I am loving that combo as well! !